This is a Korean name; the family name is Jo. Jo Jae-yoon (born September 15, 1974) is a South Korean actor. He made his acting debut in 2003 and has since starred as a supporting actor in numerous films and television series, including The Man from Nowhere (2010), The Chaser (2012), Gu Family Book (2013), and The Suspect (2013). Jo also appears in the variety-reality show Animals (2015). Law of the Jungle in Patagonia SBS Episode 305–310. Part of second-half cast member. ^ Choi, Juran (19 November 2014). "Jo Jae Yoon To Get Married Next Year". BNTNews. Retrieved 5 February 2015. ^ Sunwoo, Carla (26 July 2012). 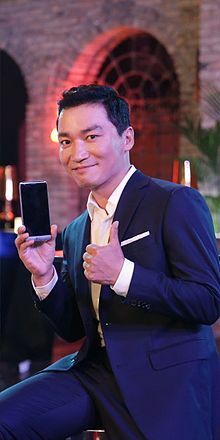 "Actor Jo Jae-yun is single no more". Korea JoongAng Daily. Retrieved 5 February 2015. ^ Kim, Dong-joo (13 June 2013). "Cho Jae Yoon highly compliments Suzy". StarN News. Retrieved 5 February 2015. ^ Hong, Grace Danbi (12 June 2013). "Lee Seung Gi and miss A's Suzy Send Birthday Messages to Jo Jae Yoon's Ailing Father". enewsWorld. Retrieved 5 February 2015. ^ Sunwoo, Carla (13 December 2013). "Gong Yoo a Suspect in his first action role". Korea JoongAng Daily. Retrieved 5 February 2015. ^ Ahn, Woorim (14 January 2015). "Yoon Do Hyun Reveals A Photo With The Casts of MBC Animals". BNTNews. Retrieved 5 February 2015. ^ Noh, I-seul (22 October 2014). "Kim Sang Kyung talks about a drinking scene in his new movie, Daddy For Rent". StarN News. Retrieved 5 February 2015. ^ Noh, I-seul. "Cho Jae Yoon reveals a photo from the first shooting for movie Atmosphere of the Day". StarN News. Retrieved 5 February 2015. ^ Ahn, Woorim (8 June 2015). "Cho Jae Yoon To Join Descendants of the Sun". BNTNews. Retrieved 2015-09-20. ^ "조재윤, SBS '기름진 멜로' 출연 "장혁의 오른팔役"" (in Korean). March 26, 2018. ^ "'SKY 캐슬' 정준호x최원영x조재윤x김병철 확정..JTBC 흥행史 잇는다[공식]". TV Report (in Korean). August 29, 2018. ^ "조재윤, ‘커피프렌즈’ 열혈 알바생 변신 “기대해 주세용”" [M+★SNS] (in Korean). 5 January, 2019. This page was last edited on 20 April 2019, at 08:14 (UTC).